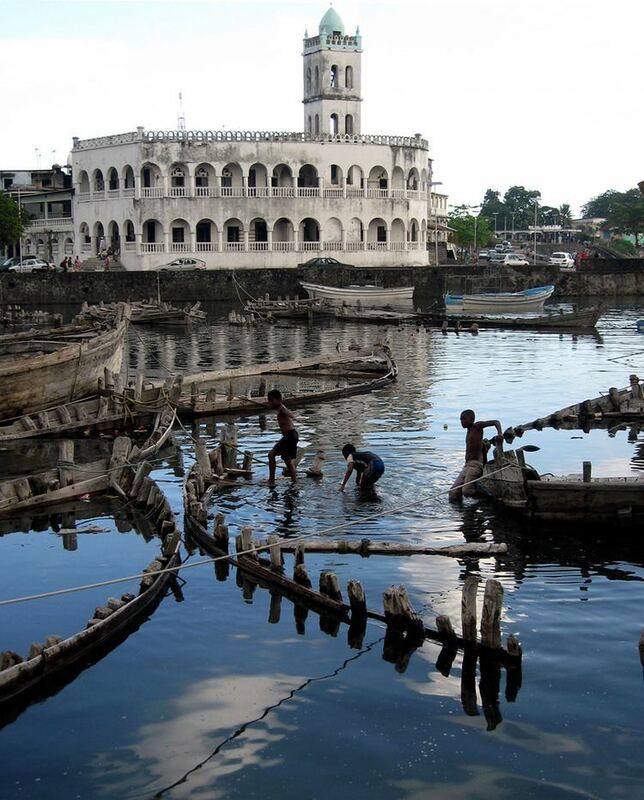 Moroni (in Arabic موروني Mūrūnī) is the largest city, federal capital and seat of the government of the Union of the Comoros, a sovereign archipelago nation in the Indian Ocean. In Comorian, Moroni translates as "in the heart of the fire", perhaps alluding to the city's location at the foot of Mount Karthala, an active volcano. Moroni is the capital of the semi-autonomous island Grande Comore, the largest of the three main islands of the republic. The city's estimated population in 2003 was 41,557 residents. Moroni, which lies along the Route Nationale 1, has a port and several mosques such as the Badjanani Mosque. 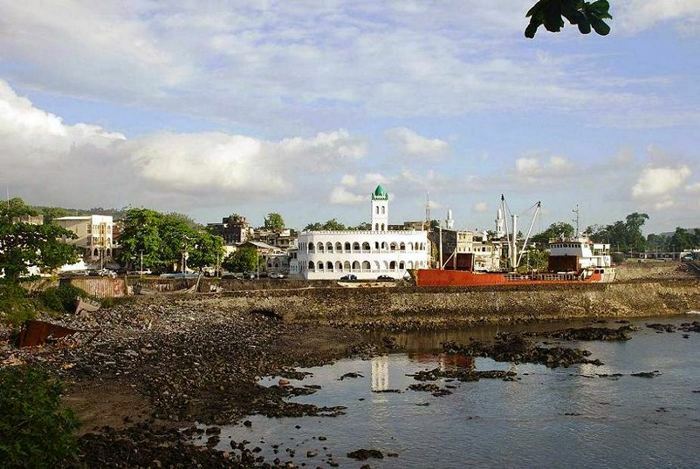 Moroni was founded by Arab settlers, possibly during the 10th century, as the capital of a sultanate connected commercially to Zanzibar in Tanzania. An agreement on broad autonomy to the three islands was refused by the Anjouan representatives which resulted in an eruption of violence affecting Moroni in April 1999, during which Colonel Azali Assoumani assumed power in a coup d'état. In December 2003, the Moroni Agreement on Transition Agreements was signed by the island presidents of the Union of Comoros. In the run up to the 2006 elections, the government-owned Radio Ngazidja and private station Moroni FM were raided by armed assailants and forced off the air temporarily. In 2010, the U.S. Navy's Seabees constructed Hamramba School in Moroni as a humanitarian project, in partnership with the local military and Comoros' federal government; construction methods included mixing concrete by hand before using buckets and wheel barrels to move the concrete to the school site. The city is on the western coast of Grande Comore (also known as N'gazidja) island. Moroni has a rocky volcanic coastline, mostly without beaches. A small beach north of town at Itsandra contains the ruins of the Sultans Fort and Palace, built in the 15th century. Settlements to the north of Moroni include Ntsoudjini, Ouellah, Bahani, Batsa, Vanambouani and Vanadjou, and to the south are Mvouni, Daoueni and Selea. Moroni is situated at the foot of Mount Karthala, 10 kilometres (6 miles) northwest from the volcano's crater. The 2,361-metre (7,746 ft) high active volcano is reported to be one of the largest active volcanoes in the world, with a diameter of about 1 mile (1.6 km), and erupting approximately every eleven years over the past two hundred years. The eruption of 2005 caused displacement of a large number of people due to volcanic ash. Moroni features a tropical rainforest climate (Af ), with generally heavy precipitation throughout the year—only October sees on average less than 100 mm (4 in) of rain (roughly 98 mm (3.9 in)). The average annual rainfall is 2,700 millimetres (110 in) and it rains during all months of the year. The monsoon season lasts from November to April. Humidity is in the range of 69 to 79 percent. Moroni's average temperatures throughout the year are relatively constant with a high in the range of 32–34 °C (90–93 °F) and a low in the range of 14–20 °C (57–68 °F). The region experiences frequent cyclones and as the islands are located more than 10 degrees below the equator in the western part of the Indian Ocean, the climate is generally termed as "maritime tropical". The volcano which forms the backdrop of the Moroni city has numerous bird species including Comoro pigeon, Karthala scops owl, Comoro cuckoo-roller, Comoro drongo, Comoro thrush, Comoro bulbul, Humblot's flycatcher, Comoro cuckoo-shrike, Kirk's white-eye, Karthala white-eye, Comoro brush-warbler, Comoro green sunbird, and Comoro fody. As of 2011, Moroni had a population of about 54,000. Sunni Muslims account for 98%, and there is a minority of Roman Catholics. Arabic and French are the official languages while Comorian, which is a Bantu language closely related to Swahili and heavily influenced by Arabic, is also spoken. Goods produced on the island are vanilla, cacao, coffee, soft drinks, processed and distilled essential oils, metal and wood products, and processed pozzolana (cement); these are exported from the port. The tourist infrastructure is poorly developed. Financial institutions include Banque Centrale des Comores, Banque de Development des Comores, and Banque pour Industries et le Commerce. Towards the south of Moroni are several markets, including the old market and the Dubai Market (Marche Dubai). The historic town centre, the Medina, contains a maze of narrow alleys and ancient buildings of Swahili period but is poorly maintained. The old city centre is based on Zanzibar's Stone Town, but is smaller. There are many mosques, notably the Badjanani Mosque pr Ancienne Mosquée de Vendredi (old Friday mosque), which is the oldest mosque in the Medina. It was originally built in 1427, and a minaret was added in 1921. The 300-seat theatre of the Alliance Franco-Comorienne serves as a venue for national and international performances, ceremonies, conferences, film screenings, and seminars. Other venues include the 700-seat Al-Kamar, the 500-seat Palais du Peuple, and the 300-seat Foyer des Jeunes de Foumbouni. The country's civil aviation authority, Ministère des Postes et Télécommunications de la Promotion des Nouvelles Technologies de l'Information et de la Communication chargé des Transports et du Tourisme, is located in Moroni, as is the National Agency of Civil Aviation and Meteorology. Moroni is served by the Prince Said Ibrahim International Airport (airport code: HAH), located at Hahaia, about 15 km (9 mi) north of the town. However, there are no direct flights to Europe. It is a civilian airport at an elevation of 28 m and has a paved runway which has dimensions of 2900 x 45 meters. Airlines which operate international flights to this airport are Air Austral, Kenya Airways, South African Airways, Air Mauritius, Egyptair and Qatar Airways covering many countries. However, between the islands the local airlines, Air Services Comores and Comores Aviation operate. An Airbus flight operated by Yemeni Airlines on its flight from Paris to Moroni crashed into the Indian Ocean on 30 June 2009 with 153 passengers and crew on board. There is a major harbour though small in size with regular transport to the African mainland and the other islands in the Comoros archipelago, as well as Madagascar and other Indian ocean islands. The port is a small quay of 80 metres (260 ft) with a draught of 3.5 metres (11 ft), and hence is not suitable for large ships to enter as coral reefs pose a threat to safety. It supports a maximum vessel size of 150 metres (490 ft). The channel depth is 24.4 metres (80 ft), with an anchorage depth of 23.2 metres (76 ft), a cargo pier depth of 4.9 metres (16 ft) and a terminal depth of 4.9 metres (16 ft). Within the harbour's mini industrial zone, a local container terminal was managed by Gulfcom Port Management SA during the period of 2006-2012, after which Bolloré Africa Logistics won the concession and it will partner with Cofipri, a Luxembourg investment company. Storage facilities such as warehouses have been established to facilitate imports and exports and also for petroleum storage.